UV Coating will be applied to the color sides, unless "No UV Coating on Back" is selected. The back of 4/1 and 4/0 products will never be coated. Postcards make a wonderful, cost effective way to deliver an advertizing message in a burst of color. PrintSafari.com's postcard printing services offer offset printing because it offers the best combination of a high image quality, a speedy production rate, and cheap postcard printing costs. Our postcard printers' online options let your business or organization use its own graphics with our postcard printing services. Cheap postcard printing doesn't have to mean inferior quality images, just great rates. We have a help center to assist you with our postcard printing services so you can upload your image and prepare you file just the way you want it. When both cost and time are of essence, our cheap postcard printing rates and average one-week order time will let you reach large numbers of people quickly. Our postcard printers offer a rush turnaround rate as fast as 3 days. 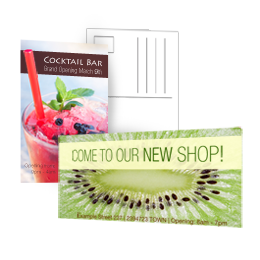 We can provide cheap postcard printing promptly. Many postcard printers lack flexibility in their postcard printing services, but we believe postcard printers ought to make ordering easy and payment simple. So at Printsafari.com we give you, the customer, all the options that you need to best reach and relate to your customers or patrons.